The one thing I am always reminding myself of is to make sure that I “Live Today Better than Yesterday” because there were too many years I just wasn’t doing it. I was a little too complacent. I accepted the status quo. I got caught up in my ways. I was comfortable doing things the way I always had. So now, I try to make sure I am growing, improving, and learning from the experiences that come my way. I can’t say that I always get it right, but having this goal has definitely helped me make continual progress and grow. I am not sure exactly when it dawned on me, but one day I woke up and realized that life really is supposed to be about growth. Our relationships are supposed to grow and deepen. We want to make progress when it comes to our goals and dreams. We are supposed to gain more clarity on who we are and what our purpose is. Essentially, we are supposed to get better and better at living. “Living Today Better than Yesterday”, can really be a measuring stick for every single thing in our life. And there are thoughtful questions we can ask ourselves from time to time. So, I’m hoping you will join me and also commit to “Living Today Better than Yesterday”. 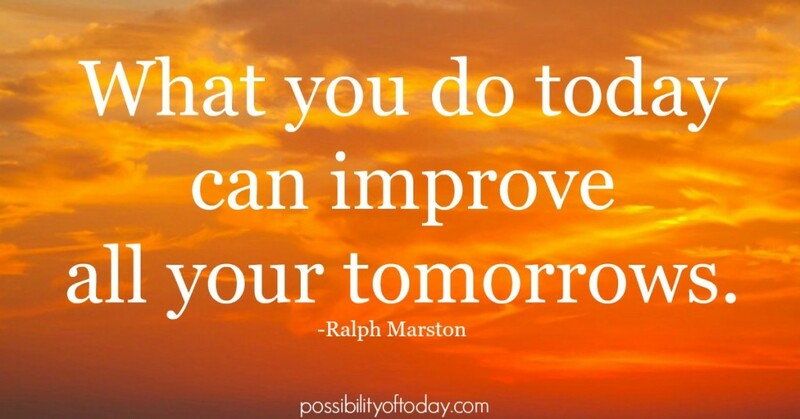 Remind yourself today that every aspect of life is supposed to continually improve and get better. Granted things may not always go the way we planned, but in one way or another everything should be progressing and moving you forward. Don’t set your bar too low. Don’t settle. If we feel like we aren’t moving forward in a particular area, we can choose to start doing something about it and stop running on the hamster wheel of life (it doesn’t matter how fast you are going if you aren’t going anywhere). 1. Don’t let life just happen: Take the time and clearly define your vision for the things that are important to you? What do you ultimately want to accomplish in each area of your life? You get to decide, so make sure that you do. 2. Commit & GO: Make a commitment to yourself to pursue and make progress in every area that is important to you. What are the steps you can take? Start taking them Today. 3. No Excuses: Realize the time is now…not tomorrow, not a year from now. Don’t make any excuses or overlook the importance of moving forward. It is time to go.